As “that time for resolutions” has rolled around again, I sincerely hate discussing all my promises to myself that “this is gonna be the year.” I am a liar. “Mommy sends Santa a monthly report, and this is going in it.” “We’re leaving.” “No TV for a week.” Blah, blah, blah…I’m a liar, and I’m fine with it. As I look back over the sordid history of my clichéd resolutions to lose weight, exercise, and be a better person, I realized that, though I’m a decent person/wife/mother/friend/Christian/etc., I am batting a whopping .000 for resolving to do things I needed to actively change about myself. I haven’t lost weight. I exercise, but it’s not like I’m burning up my Jazzercise classes. I read, but most of it isn’t good for me…after teaching high school English for so many years, I just want a ditzy blonde to solve a mystery already. 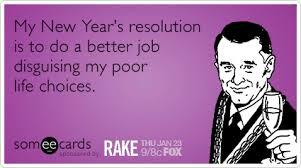 When it comes to new year’s resolutions, I expect to fail. 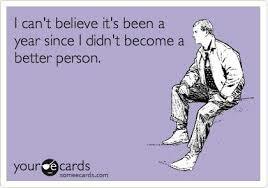 I have even ceased to feel bad about it. Gain at least 50 pounds, preferably 75. The world is full of good food, so why should I ever deny myself? Never ever exercise. I hate sweating. That 6-minute drive to the gym isn’t doing it for me. Make sure that the house is an utter pig-sty (conveniently, my husband already believes that it is). So, wait til he sees me now! Look out! A dust bunny just flew by your head! Move the laundry so you can sit in the living room. Oh, I know the sink is full of dirty dishes…just put them on the counter if you can find a spot. If possible, employ even more sarcasm and yelling into parenting my three children. Allow the kids to go with their own personal hygiene choices: bathing, brushing teeth and hair…you know…just let them do their thing. Dread locks are awesome on 9-year-olds. Spend at least 6 continuous hours per day on Facebook or similar social media. Spend way more money on my wardrobe and personal grooming. If it’s on sale, I ain’t buyin’ it. Actively attempt to start arguments with my spouse because it’s just been too long since we last yelled at each other. Bonus points if it’s in front of the kiddos! Teach my kids all the swear words…not just under my breath but in a PowerPoint presentation with definitions and sample sentences. Bonus points if they teach the other kids at school. Double bonus points if I get a phone call from teachers or parents reminding me it’s not cool to curse at the Christian preschool. Okay, so now that I’ve clearly laid out plans to become an utterly horrible person, I can fail miserably and face 2017 knowing that I’m keeping life between the navigational beacons. Thanks for reading, everyone! 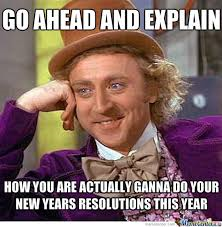 And please feel free to add any anti-resolutions (yelling at Girl Scouts selling cookies, anyone?) in the comments below!